Rajasthan, MP, Mizoram, Telangana, Chhattisgarh Assembly Election Results 2018 highlights: The results in Hindi heartland states of MP, Chhattisgarh and Rajasthan have come as a shot in the arm for the Congress in the run-up to the 2019 Lok Sabha elections. Rajasthan, MP, Mizoram, Telangana, Chhattisgarh Assembly Election Results 2018: The results will have a bearing on efforts to forge opposition unity for the 2019 elections. Rajasthan, MP, Mizoram, Telangana, Chhattisgarh Election 2018 highlights: Ending its prolonged electoral reversals, a reinvigorated Congress produced a resilient comeback as it is on course to oust the BJP to form its governments in Rajasthan and Chhattisgarh. Madhya Pradesh is witnessing a tantalisingly close fight between the ruling BJP and the opposition Congress. The TRS, on the other hand, secured a thumping majority in Telangana while MNF has defeated Congress in the latter’s last bastions in Northeast. As of 10.30 pm, Congress has won 35 seats and leading in 33 others, while BJP has won 7 and leading in 9 others in the 90-member Chhattisgarh assembly. In Rajasthan, the Congress emerged as single largest party by securing 99 seats. However, it fell two seats short of crossing 101-majority mark. It now needs support and post-poll alliance to form the government. BJP, on the other hand, could win only 73, down from 163 in 2013. In MP, the Congress has won 69 seats and leading in 44 seats, while BJP has won 66 seats and leading in 44 seats. In the event of not crossing the majority mark, the Congress may need to stitch a post-poll alliance with BSP and Samajwadi Party. He also thanked BJP cadres for their work during these elections and said: "Today’s results will further our resolve to serve people and work even harder for the development of India." Congratulating Congress for emerging as the single largest party, outgoing Rajasthan CM Vasundhara Raje said she accepts the mandate given by the people and that her party will keep raising people's issues. "I would like to congratulate Congress. I accept this mandate by the people. BJP has worked a lot for them in these 5 years, I hope the next party takes those policies and works forward," Raje told reporters in Jaipur. Buoyed over the Congress' performance in Hindi heartland states of Madhya Pradesh, Rajasthan and Chhattisgarh, Congress president Rahul Gandhi dedicated the victory to farmers and youths. "We have defeated BJP in Rajasthan, MP and Chhattisgarh," Gandhi told reporters. He stated that the Congress will provide these states a vision. "We are going to provide these states a govt that they can be proud of," he added. Dr Raman Singh, speaking to the media in Raipur, said the elections were fought under him and therefore the defeat is his responsibility. "I won't discuss the reasons for today's defeat but I congratulate the winners and thank all the party workers for their effort," Singh said. Asked if today's defeat would have an impact on the 2019 polls, Singh said the elections were different and the party would put in all effort to ensure their victory in the upcoming general elections. Celebrations are underway in Chhattisgarh where the Congress has come back to power with 63 seats leaving the BJP with 18. RLD vice president Jayant Chaudhary has announced that his party will support the Congress in Rajasthan. The party has won one seat. The Congress is leading in 104 and the BJP in 70. Voters have rejected what was unwanted, congratulations to them: Shiv Sena chief Uddhav Thackeray on assembly poll results. The Congress is leading in Madhya Pradesh, Rajasthan and Chhattisgarh. Tamil Nadu BJP chief Tamilisai Soundarajan expressed confidence that the BJP will bounce back in 2019. "The result is just a setback; it’s not a defeat. People still want Narendra Modi to continue as PM and they don’t prefer Rahul Gandhi, and we have not suffered a huge defeat in any of the states. The union of opposition parties will not affect BJP. Modi wave will never ever recede. We never jump on victories nor lie down on defeats. I just have one thing to say to Congress; whenever we managed to win the elections, you say it’s due to faulty electoral machines, what about your victory now?" Congress is back in the lead in Madhya Pradesh. The party is presently leading in 115 seats, while the BJP is leading in 105. Meanwhile, the Shiv Sena said the outcome of the elections in the five states was a clear message to the BJP and there was a need for the ruling coalition to introspect. Chhattisgarh Congress President Bhupesh Baghel has arrived at Congress office in Raipur. He says, “People of Chhattisgarh took the fight in their own hands. We are grateful to Rahul Gandhi, we fought for the people. We got more seats than expected, high command will decide who will be the chief minister." People have recognised that BJP has done nothing in the last 5 years and they are moving towards other alternatives. People are with us in our fight against BJP. These 5 states results will help form a strong alternative to the BJP. TDP respects the mandate of people of Telangana. Congratulations to Shri K. Chandrasekhar Rao. Also, best wishes to all the newly elected public representatives of 5 states. Andhra Pradesh CM Chandrababu Naidu concedes defeat, says TDP respected the mandate of people of Telangana. "Congratulations to K Chandrasekhar Rao. Also, best wishes to all the newly elected public representatives of 5 states," he said. T Harish Rao, the nephew of KCR, said people had reposed faith in the TRS chief. "The people reposed faith in the leadership of our chief minister and they did not believe in the disinformation campaign of the opposition," said T Harish Rao. Emerging kingmaker in Madhya Pradesh, BSP chief Mayawati has reportedly called all her winning MLAs to New Delhi for a meeting. The Congress will be hoping to stitch a post poll alliance with the BSP. While the party was supposed to have a pre-poll alliance, Mayawati pulled out following a disagreement over seat sharing. It will now be for the Congress to woo Mayawati and consequently form government. Following a massive defeat in the Telangana elections, the Congress party has moved the Election Commission blaming EVM machines. "There is a strong suspicion that EVM machines have been manipulated," the Congress wrote in its letter to the EC. "The Congress party requests that 100% counting of VVPAT papers should be taken up in all Assembly constituences of Telangana prior to the declaration of the results." TRS President and Telangana caretaker Chief Minister K Chandrashekhar Rao wins from Gajwel constituency by over 50,000 votes. While the Congress appears set to form government in Rajasthan, the vote share difference between them and the BJP is just about a percent. "It's even-steven in Madhya Pradesh"
National Conference leader Omar Abdullah is watching the election results closely. "It’s even-steven in MP & from what I hear the BJP hasn’t given up the hope of forming a government there. “Others” in Madhya Pradesh will be a happy lot at the moment," he tweeted. MNF party workers have begun celebrations outside the party office in Mizoram following the party's sweep in the Assembly election results. The Communist Party of India said the results in Telangana are unexpected, adding that TRS resorted to "huge distribution of money and liquor" to influence voters. The party said the victory was a "technical, not a moral one". 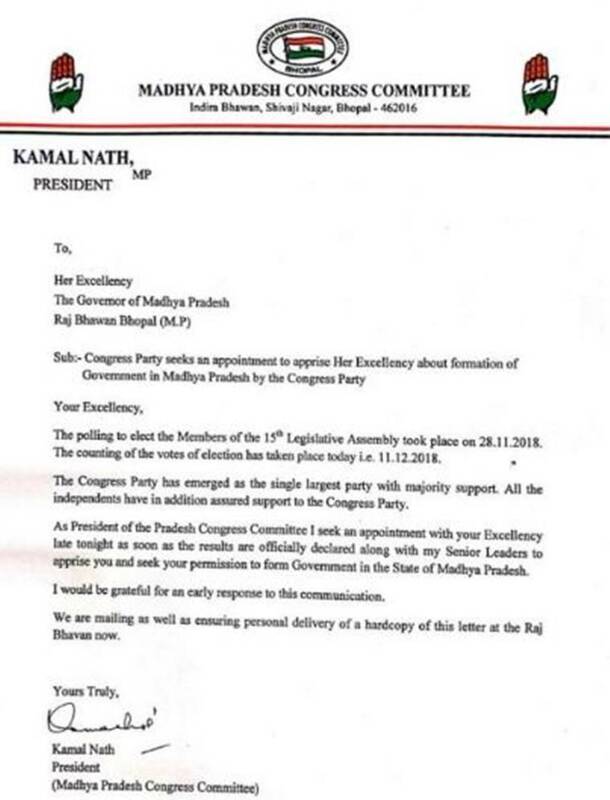 CPI is part of the Congress-led alliance in the state. "Huge distribution of money, particularly on the last day (before the election)...purchasing votes..this must have resulted in this victory for TRS," Reddy alleged. "Most important: this election was not free and fair. Distribution of money and liquor... I don't think it's a moral victory for him (Rao), it's only a technical victory for TRS." "People have rejected the BJP across three states. They were in power and used govt machinery but still could not win the elections. Sitting ministers are losing their seats. We will form a comfortable government in the state. We will be open to like-minded parties as well as those who are against the BJP's ideology," Congress Rajasthan party chief Sachin Pilot said. In Telangana, TRS chief K Chandrashekar Rao is set to retain power and come back as chief minister for a second term. "The losing party always says the EVMs have been tampered with, this is absolutely false. Even the CEC in a press meeting yesterday said that it is not possible to tamper EVMs. People have given victory to TRS, what Congress is claiming is false," K Kavitha, TRS MP said. 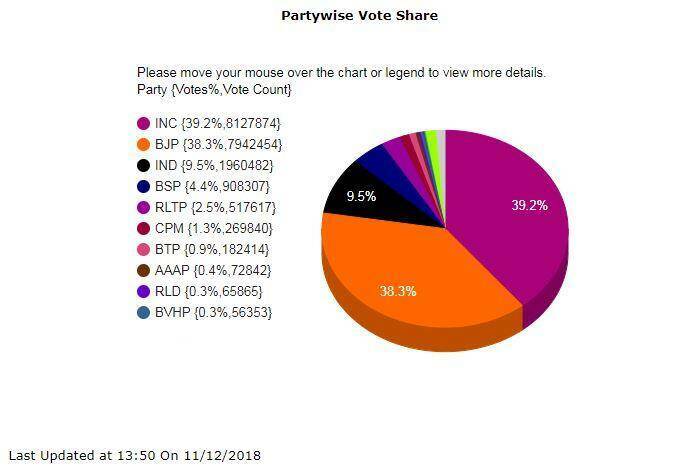 While the BJP and Congress continue to fight it out on seats, the voteshare of the two parties has a difference of just .5 per cent. 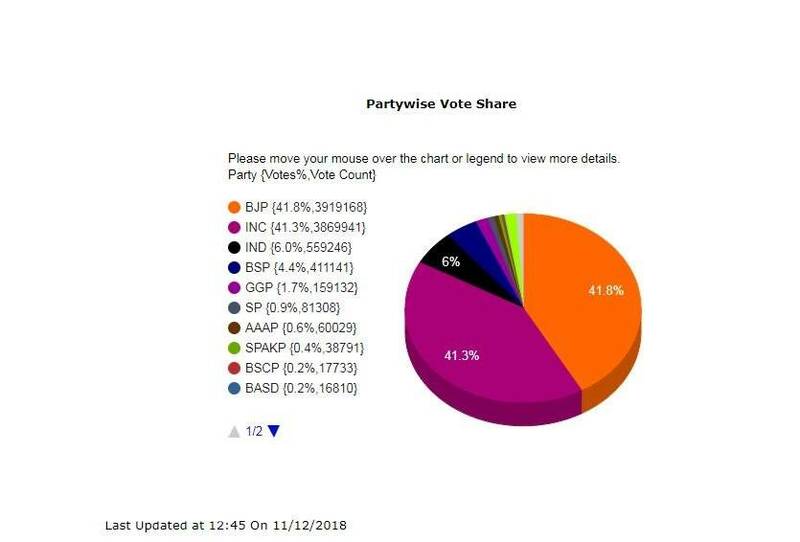 This is data from the Election Commission of India as of 12.45 pm. The BJP is putting up a tough fight in Madhya Pradesh and Rajasthan where the numbers are reversing every few minutes. In Madhya Pradesh, the Congress is currently leading in 109 seats while the BJP is leading in 107 whereas in Rajasthan, the Congress is leading in 94 while the BJP is leading in 80. Former Rajasthan chief minister Ashok Gehlot is speaking to reporters. "Congress has won the mandate. Numbers can go up and down but public's mandate is in the favour of Congress. We will get clear majority, still we would want independent candidates and parties other than BJP to support us if they want." As things stand, the Congress is still short of a full majority in the state. Gehlot's statement to media hints that the Congress is open to forming a post-poll alliance with independents or like-minded parties. However, history shows that the BJP has always managed to outmanoeuvre the Congress in states that threw up a hung verdict. Speaking to reporters outside Parliament House, Home Minister and senior BJP leader Rajnath Singh congratulated all the winners of the five elecion states but added that the results were no referndum on the performance of the Central government. "I congratulate all those who have won the elections... the results are not an indication of the performance of the Union government," Rajnath Singh said. With about five rounds of counting left, the BJP has put up a tough fight and has taken lead again. The BJP is currently at 114 while the Congress is at 107. The BSP is with 5 seats. TMC chief Mamata Banerjee tweeted following the election results saying it was a victory of the people against divisive politics. "People voted against BJP. This is the people’s verdict and victory of the people of this country. Victory of democracy and victory against injustice, atrocities, destruction of institutions, misuse of agencies, no work for poor people , farmers, youth, Dalits, SC, ST, OBC, minorities and general caste. Semifinal proves that BJP is nowhere in all the states. This is a real democratic indication of 2019 final match. Ultimately, people are always the ‘man of the match’ of democracy. My congrats to the winners." "We should wait till the end for the results but it is clear that the Congress is going to form government in three states. The hardwork of the Congress party over the five years has shown in the results. The people have blessed us... we will get a comfortable majority in Rajasthan," Sachin Pilot said, speaking to reporters in Jaipur. When asked if he would be CM, Pilot said "the decision is Congress president Rahul Gandhi's." Congress leader Ashok Gehlot reiterated that the Congress will form government in Rajasthan and that it was all the hardwork of Congress president Rahul Gandhi. He refused to comment on whether he would be the next chief minister of the state. Speaking to reporters in Madhya Pradesh, senior Congress leader Kamal Nath said his party was confident of winning with a full majority. "No, we won't need outside support.. we will form government on our own," Nath told reporters when asked if he would approach Mayawati's BSP for support to form government. 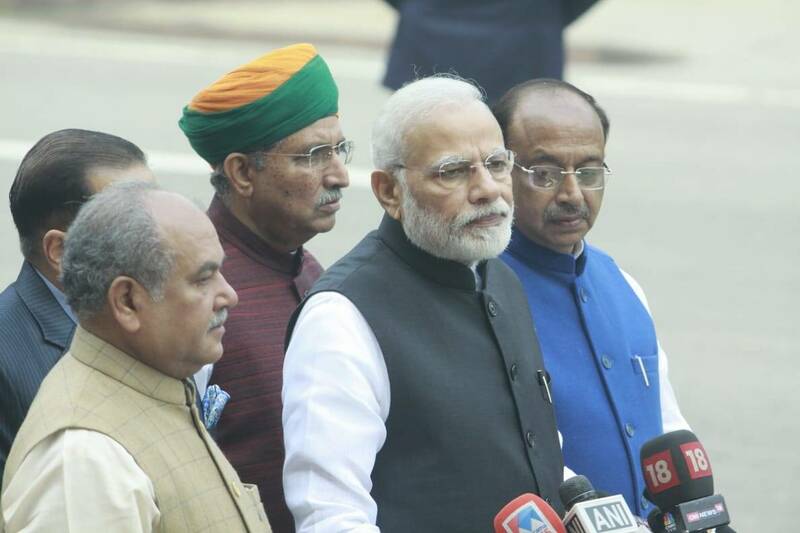 Speaking to reporters outside Parliament in his customary address, Prime Minister Narendra Modi said: This session is important, many issues of public importance will be taken up. I have faith that all the members of the Parliament will respect this sentiment and move ahead. Our efforts are that discussions are held on all issues. Will Congress leader Ashok Gehlot be made chief minister? Going by the way party workers are celebrating he could well be, if the party manages to form government. His car has been decorated with roses! In Mizoram, the MNF is back to power and they have begun celebrations. News agency ANI has shared this picture from the state where the party has taken an unassailable lead. Assembly Election Results 2018 highlights: Madhya Pradesh, Chhattisgarh and Rajasthan account for 65 Lok Sabha seats, of which the BJP had won 62 in 2014 when the wave swept the Hindi heartland. 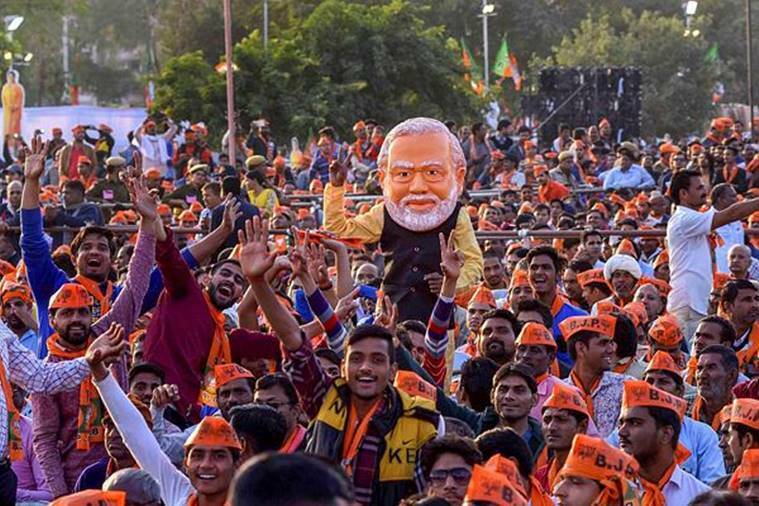 The outcome of the Vidhan Sabha elections are significant as Madhya Pradesh, Chhattisgarh and Rajasthan account for 65 Lok Sabha seats of which the BJP had won 62 in 2014 when the Narendra Modi wave swept the Hindi heartland. Agrarian distress emerged as one of the significant issues raised by the Congress in its campaign. A good showing in these states would prompt the Congress to step up its attack on the government on farm distress, an issue which put the BJP on the backfoot a year ago in Gujarat as well. Most of the exit polls predicted a comfortable win for Congress in the Rajasthan Vidhan Sabha assembly election results with the grand old party marching towards a majority mark. The BJP is battling strong anti-incumbency in Rajasthan, a state that has not voted the ruling party for a second term in the last 20 years. For Chhattisgarh, most of the exit polls for the Chhattisgarh Vidhan Sabha election results have predicted a photo finish for the state, with a neck-and-neck contest between the BJP and the Congress. If exit polls are to believed, the BSP-JCC coalition may win between three and eight seats, which may help Jogi to emerge as a kingmaker in case of a hung assembly, which is a likely outcome. All major exit polls for Telangana Vidhan Sabha election results have shown the TRS having a clear edge over the grand alliance that was quickly stitched after KCR announced his decision to go for early polls. The final voter turnout was 73.02 per cent despite many complaining that their names were missing from the voter rolls. Exit polls have predicted a hung assembly for Mizoram Vidhan Sabha election results. In 2013 assembly elections, the Congress won 34 seats, while the Mizo National Front (MNF) had five and Mizoram People’s Conference bagged one seat.